The 'Burbs is the story of paranoia about new neighbours in a typical affluent American suburb. mekaty is right. I also watched the film and almost same feeling. I watched it at home in TV. I saw this movie and really thought it was way funny, as it actually had me laughing. 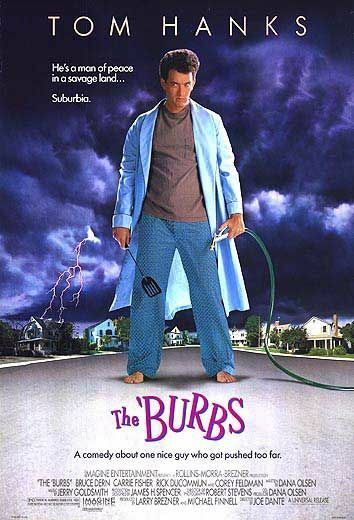 I don't think it's on the site any more but still here's a trailer of "The Burbs"
This movie Directed by Joe Dante,writer by Dana Olsen,Starsis Tom Hanks,Bruce Dern,Carrie Fisher. I saw my dad watching this movie at home. Old is gold. one of my friend told me about this movie sometimes ago... but didn't watch.